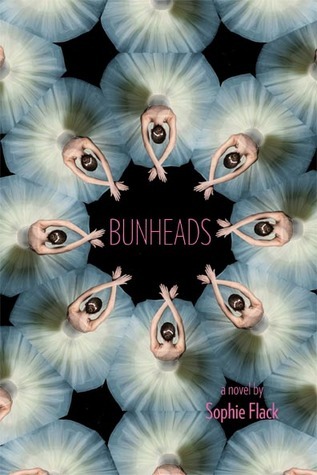 Bunheads by Sophie Flack. Grades 7+ Poppy (Little, Brown), October 2011. 294 pages. Reviewed from ARC snagged at ALA.
Hannah is a total bunhead, but don't call her a ballerina. She's been a corps dancer for the Manhattan Ballet for what seems like far too long. But although she longs for the spotlight (a coveted soloist position), she's also wondering about life outside the dark theater. When she meets a cute guitar-playing college student at her uncle's restaurant, she tries to balance a relationship with the heavy demands of her job, but it's not easy. Hannah starts to wonder if her sacrifices will ever pay off... and if they do, is the life of a principal ballerina really what she wants? This book reminded me of nothing more than the movie Center Stage*. The dialog sometimes felt awkward and a bit expository. Besides Hannah, the characters were not very developed or nuanced. I never felt particularly compelled by either of the potential romantic leads (and honestly, neither did Hannah). The real strength of this book is the beautiful and detailed portrayal of the ballet life. The beautiful descriptions of the dances, costumes, and makeup bring the reader onstage with Hannah. Sophie Flack's insider perspective enables her to bring readers backstage as well, giving a look at the drama and competition between the dancers. What impressed me the most was Ms. Flack's portrayal of Hannah's ambivalence. There are no easy decisions here. On one hand, Hannah's sacrificing everything for her career - her relationships, her health, and any other possible life she might dream of. She can't even find the time to finish one book. On the other hand, dance is Hannah's passion and she's one of the lucky few who has a job that pays her to do the thing she loves most in the world. That's not something that's easy to walk away from. Although I doubted Hannah's ambivalence between the two guys who were interested in her, not once did I doubt in her struggle between exploring all life had to offer and embracing her destiny as a dancer. Sophie Flack gives us an insider's view as very few can and I hope to read much more from her. Hand this to teens who are interested in the theater life or obsessed with reality dance shows. I'd also try it on fans of Sarah Bennett Wealer's Rival or E. Lockhart's Dramarama or Barbara Snow Gilbert's Broken Chords (I haven't read this last one, but it was recommended to me by a Goodreads friend!). Bunheads will be on shelves October 10!